Elizabeth Harding arrives in Cheyenne, Wyoming, to establish her medical practice thanks to the wooing of her two older sisters who extolled the beauty of the land. She's certain she'll have a line of patients eager for her expertise and gentle bedside manner. However, she soon discovers the town and its older doctor may not welcome a new physician. Even more frustrating, the handsome young attorney next door may not be ready for the idea of a woman doctor. For his part, Jason Nordling has nothing against women, but he's promised himself that the woman he marries will be a full-time mother. Despite their firm principles, Elizabeth and Jason find that mutual attraction--and disdain from the community--is drawing them ever closer. And when the two find themselves working to save the life and tattered reputation of a local woman, they'll have to decide how far they're willing to go to find justice--and true love. 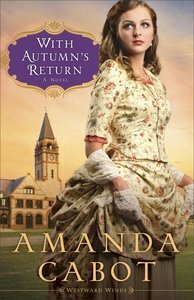 About "With Autumn's Return (#03 in Westward Winds Series)"
Amanda Cabot is an accomplished author under various pen names. She is a charter member of Romance Writers of America, the co-founder of its New Jersey chapter, and an avid traveler. She lives in Cheyenne, Wyoming. Customer Reviews For "With Autumn's Return (#03 in Westward Winds Series)"
I love Amanda Cabot! She is such a beautiful writer. In this last book in the series, we meet the youngest sister who has trained to be a doctor - in a time where that just wasn't done. She struggles, despite her passion, to convince the people, and one young man in particular, that she is capable. Along the way, she also discovers some things about herself and why she chose this life. There is healing and restoration and a finding of herself. There is also fun in the relationship with the Attorney and their journey is a cute way to bring in the romance. Available 0 Available. Expected to ship in 1 week from Australia. 0 Available. Expected to ship in 1 week from Australia.